The day starts a lot easier when you wake up just minutes from Disneyland® Resort. It gets even better when you find out breakfast is just down the hall and your five-minute Dream Machine shuttle ride is free. That’s the bright-eyed way to vacation with the family. Add our Grand Opening Package that saves up to $127/night and your stay is nothing less than Majestic. 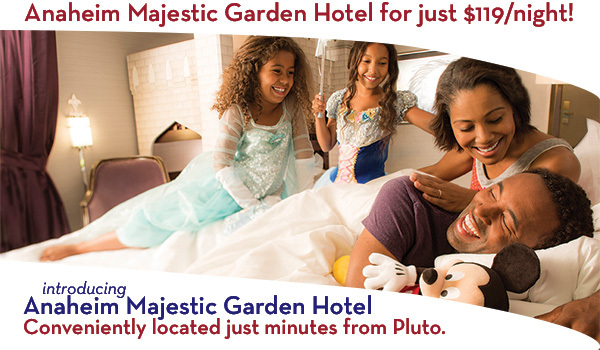 *Terms & Conditions: Must use offer code MAJESTIC to secure this rate. Reservations must be booked in advance, based on availability, some black out dates apply. Includes parking for one vehicle. Additional vehicles at $14/night. Rate is based on double occupancy. Additional people in the room will be charged $10/person/day and includes breakfast. This offer is not available for groups and can’t be combined with any other offer. Reservations are fully pre-paid at time of reservation and non-refundable.